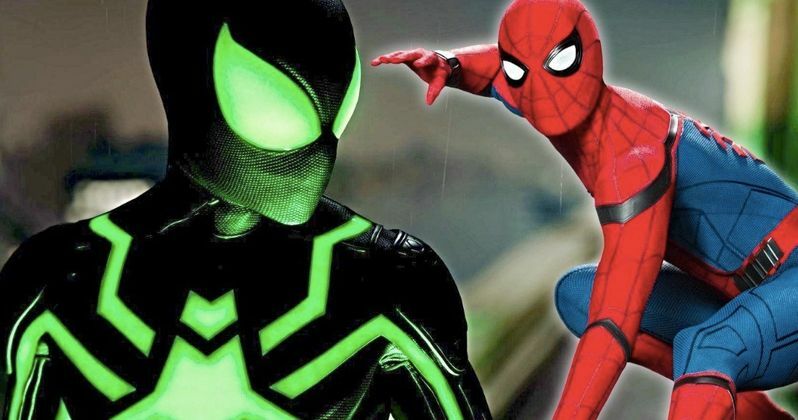 Spider-Man's Black Stealth Suit Revealed in Far from Home Set Photo? Peter Parker's Stealth Suit may have just been revealed in a new image from the set of Spider-Man: Far from Home. A steady stream of photos from the set have made their way online since production started in England, but most of them have been of Tom Holland as Parker along with other members of the cast in different locations around Europe. Marvel Cinematic Universe fans are still waiting to get confirmation on who the main antagonist will be in the film. The latest image from the set of Spider-Man: Far From Home features what looks to be the Stealth Suit as Spidey clings to a Ferris wheel. The photo is pretty dark, but it appears that Peter Parker is wearing the iconic black suit from the comics while spying on someone. Even in low-quality, it's easy to see that there is something different with the color scheme of the suit. The Stealth Suit was first introduced in the comics as a way for Peter Parker to combat the Hobgoblin's sonic Screams. The high-tech suit is able to warp sound and light surrounding it, which also makes it invisible. As for how Parker would have access to such a technologically advanced suit, it could have been a gift from S.H.I.E.L.D. to help on a top secret mission. Samuel L. Jackson's Nick Fury and Cobie Smulders' Maria Hill are in Spider-Man: Far From Home, so they could have been the ones to get Parker his new Stealth Suit. However, the new suit has yet to be officially confirmed at this time. Spider-Man: Far From Home is currently filming in different locations around Europe. Last week, the cast and crew were in Prague and pictures of Tom Holland and Zendaya were leaked online. The two were walking around the streets at night while a separate crew was setting up an explosion scene on a river. While nothing specific about the storyline was revealed, it did point to a possible budding relationship between Peter Parker and MJ, since they were the only characters involved in the shoot. The Stealth Suit would be a pretty cool addition to Peter Parker's arsenal, so let's hope that Spider-Man: Far From Home ends up utilizing it at some point. The sequel is set to hit theaters next July after the events of Avengers 4 and MCU fans are wondering how Peter Parker makes it back from death after the conclusion of this year's Infinity War. There are a ton of fan theories floating around online, with new questions popping up every week. With that being said, Marvel Studios doesn't really volunteer too much information about their projects, leaving their actors to leak potential spoilers by accident. Tom Holland has pretty notorious loose lips, so we could end getting some secret intel in the near future. You can check out the image of the possible Stealth Suit below, thanks to the Daily Spider-Man Instagram page.